Johnny Turbo’s Arcade hit Bad Dudes vs Dragon Ninja is a brawler typical of it’s time, which made its way over to the Switch. 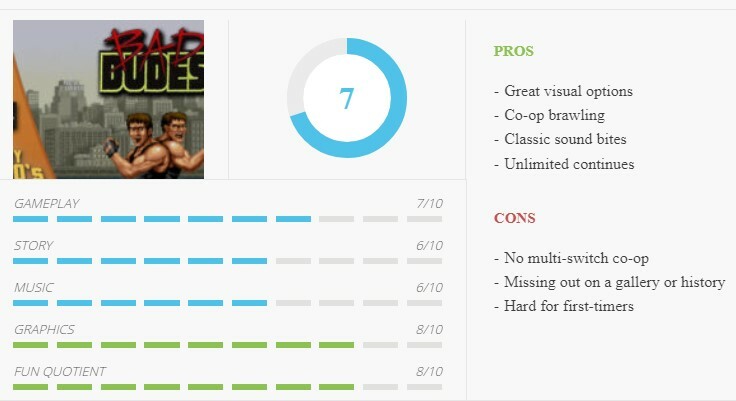 Loving myself some old-school beat-‘em-ups, heavy duty pixels and classic sound bites I was delighted to see the review code arrive in my mailbox, ready to get brawling! Choose one of the ‘Bad Dudes’, New York’s own street-wise brawlers, Blade and Striker, and set out on a mission to save the kidnapped President, Ronnie, from the rampant ninjas, a story that places itself squarely somewhere between the early eighties and mid-nineties, fitting for an arcade beat-‘em-up of this caliber. There are no surprises when it comes to the controls of the game, for it features the basic analogue directional inputs, as well as having an attack and a jump button. Bash these two simultaneously and you’ll find yourself pulling out a whirlwind hurricane kick while flicking the stick left and right. Point your stick down or up while jumping to change your fighting plane. 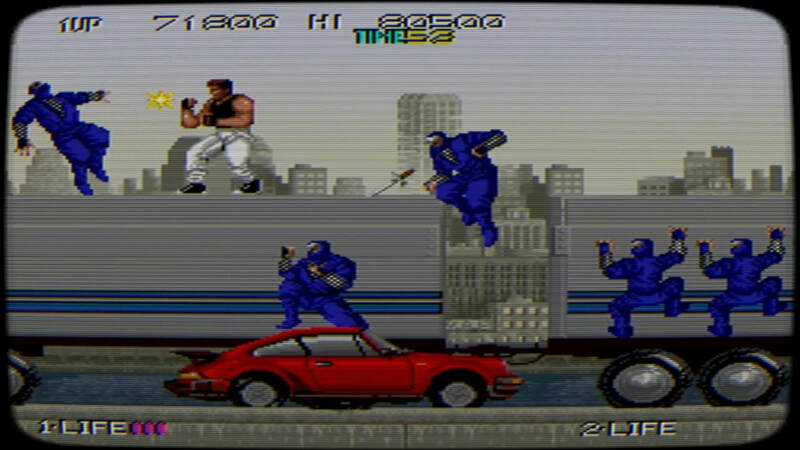 There is enough variation amongst the different stages, with the regular street scene, forest battle, and even a sewer, or fight on top of moving train wagons or trucks while ninjas climb their way up, with parallax scrolling fore- and backgrounds. While most enemies require a single short-range punch or kick, employing the various weapons definitely helps out, especially the nunchakus which increase your hit range considerably. 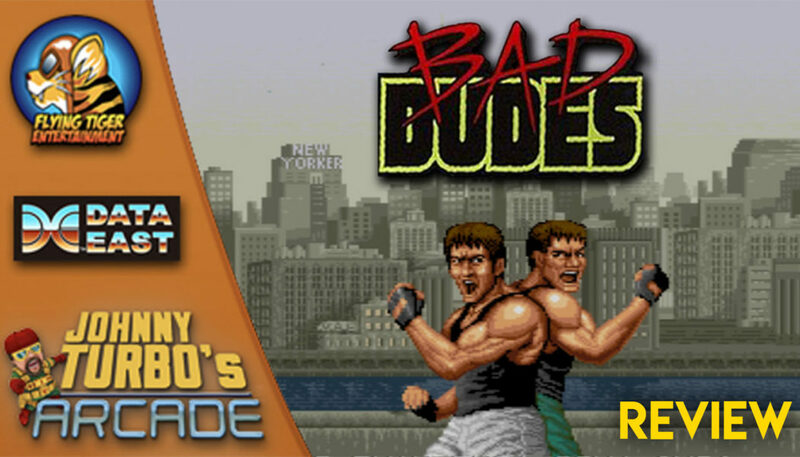 When it comes to retro-style graphics, Bad Dudes is a treat. 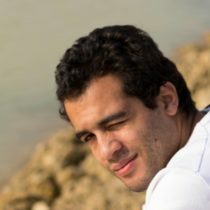 It supports both 16:9 and 4:3 screen aspect ratios, as well as an option for a filled screen. There are plenty of filters for you to apply, for each according to their taste. During most of my playtime, I applied the rounded scanline filter, which mimics our old CRT television set aptly. Mixing it up every now and then with other filters, or no filter at all keeps the game fresh and fun. 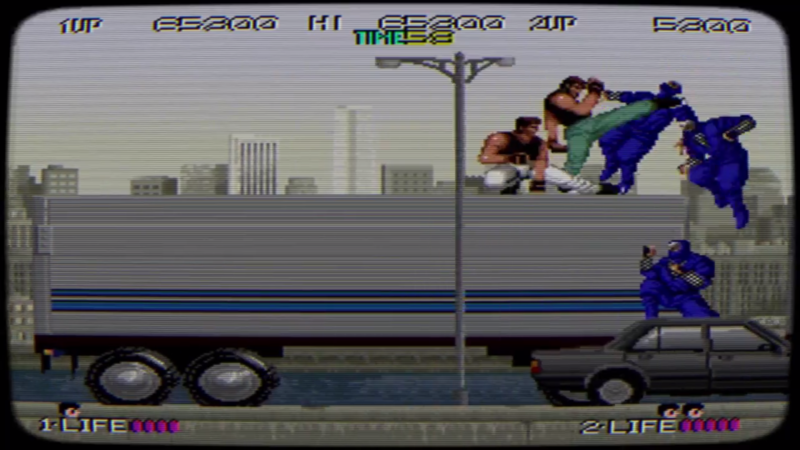 The sound bites are as retro as they come, doing justice to the arcade version of this game, while the background music feels a bit underwhelming. Saving President Ronnie all on my own got somewhat stale after a few run-throughs, while in co-op mode there couldn’t be enough ninja’s thrown my way. Going at it together, coordinating the screen, beating up baddies, picking up their dropped weapons and sipping some refreshing coke is the way these arcade brawlers are meant to be played. Don’t worry about going at it with an uninitiated friend for this game features an unlimited supply of coins to down the coin slot. Whereas this game has enough potential to leave me penniless over at the arcades, flipping those coins in after a certain death makes it absolutely worth it. The catch, of course, is that it can make one a little careless in their actions, as there is no game over, as long as you pop in those suckers in time. Does that matter much? Not really. 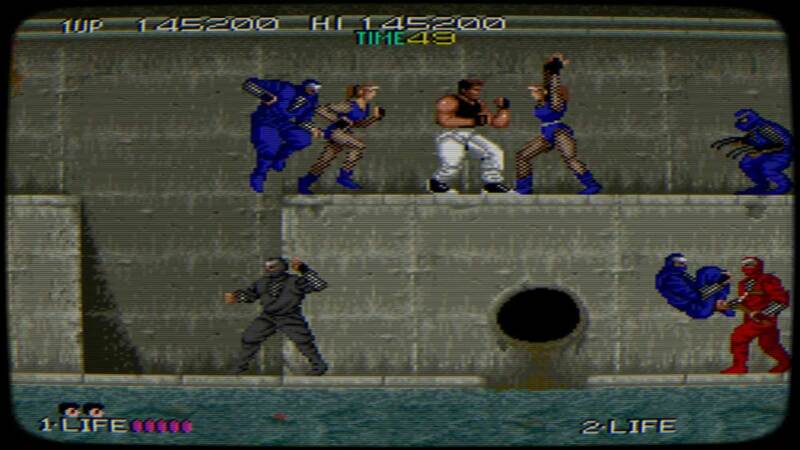 While old-school beat-‘em-ups have always been about dedication and insane difficulty levels, I think the unlimited lives-system in Bad Dudes is a very welcome feature for today’s day and age, where there is too much competition, distraction and simply no time or effort for people to really dig into that one game, master all the levels, study all the bosses and know all the ins and outs of the game. Without this system, unfortunately, plenty of people would be trailing off, leaving President Ronnie in the hands of the vicious ninja clan, as you’ll be losing a lot of lives trying to dodge falling stalactites, jumping around spikes, ducking out of the way of flying ninja stars, or facing an overzealous boss. Another neat feature is the save game state, which allows the player to save, quit the game, and jump right back into the action at a later point in time. 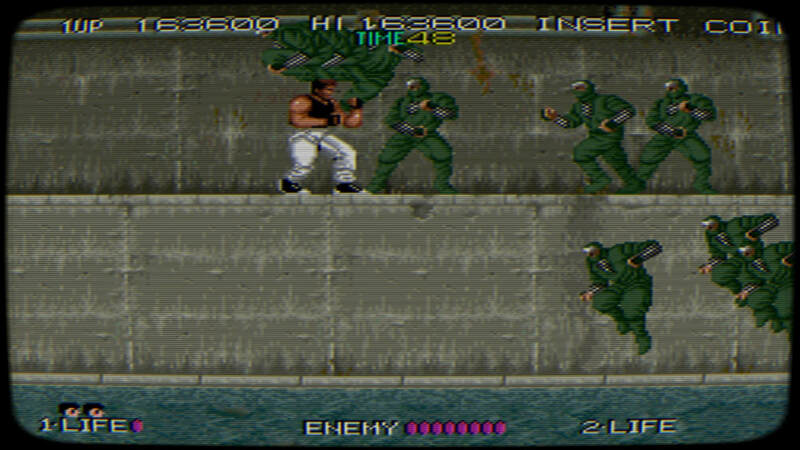 Whereas Bad Dudes vs Dragon Ninja won’t be all that memorable for newcomers to this game or timeframe of the original arcade version, it is definitely worth revisiting for those who grew up in the eighties and nineties, seeing Jean-Claude Van Damme stretching his long legs, warming up for the next fight. It offers a lot in terms of nostalgia with some solid extra features. It sure could have done well with an incorporated gallery, trivia or historical overview of the game to give it a little extra though. Given the nature of the Switch, it would have been really neat to have been able to brawl it out with 4 players in co-op mode, or even have a local-multiplayer adventure, features which might come in a future release one day.